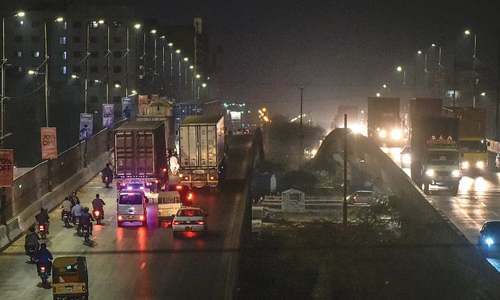 KARACHI, March 30: A new township adjacent to the Khuda ki Basti and with all basic amenities is coming up fast to rehabilitate those displaced due to the execution of the Lyari Expressway project. It is the second site being developed by the Lyari Expressway Resettlement Project (LERP) in the Taiser Town Scheme-45 in sectors 35, 36, 50 and 51 for the rehabilitation process. Launched in June 2003, the project is making good and speedy progress. A visit to the site shows that as many as 9,911 housing units allotted to the affected families have been completed while another 6,500 units are under construction. A total of 17,448 housing units are expected to be developed at the project site, it is learnt. The town, a suburban sprawl, is being developed at a fast pace with priority having been accorded to the availability of all basic facilities, including transport linking it with the main city to facilitate the social and commercial activities expected to be hectic in near future. A green look is being given to the resettlement site with plantations on both sides of the main and link roads and vital public buildings such as school, dispensary, mosque, market, government offices, etc. Plantation is being carried out through the recycled sewerage water treated through a drip irrigation system. Amazingly, in a short span of time, steps have been taken to complete the internal and external road network. A shopping centre with 75 shops has also been built to ensure availability of essential commodities to the local residents. It has been observed that learning from the Hawkesbay Resettlement Scheme, this time the LERP has given priority to the availability of basic facilities such as water supply, sewerage, storm-water drain, gas and electricity. Consequently, steps have been taken to provide facility of piped water to the people and a supply line in this regard has almost been completed. It is expected that the town will receive drinking water within weeks through a 24 inch-dia pipeline linked with the NEK filter plant. The total length of the pipeline is nine kilometres. The KESC has also completed electricity works in sectors 35, 36 and the administrative corridor while work is in progress in sectors 36/A, 50 and 51. Besides that, work on gas network has also been completed in sector 35 while the work the in sectors 36/A, 50 and 51 is in progress. Arrangements have been made for loan facilities through banks for the purpose of house construction and small business. Currently, two private banks are operating in the area to help people in this regard. Separate hawker sheds have been developed at various places to prevent encroachments in the resettlement site. At present, two hawker zones exclusively reserved for women have been constructed to enable the womenfolk to run their own retail businesses. Besides that, space has been reserved for community centres, sports and parks. The town also has a post office, maternity home, women skill development centre, a dispensary and a chain of public and private sectors schools with a tidy environment. The idea of introducing zoning and block system for each activity is aimed at preventing encroachment on government land in future. Area people, interviewed during the visit, said they were very happy with their new life because of the availability of all facilities, particularly free education for their children. Though the majority of the students belong to the resettled families, a sizeable number of students from the nearby locality of Khuda ki Basti are also attending the town’s schools. The LERP Project Director, Shafiqur Rahman Paracha, said the focal point of the project was to introduce a network of educational institutions besides provision of civic amenities. The resettlement site has 19 schools — 17 primary and two secondary. Five of them are being managed by the Citizens Foundation and two by the Pakistan Baitul Maal. The total number of students in all the 19 schools is more than 4,000, according to him. He said because of the increasing number of students, many schools have started afternoon shifts. Free quality education was being imparted to the students, he said, adding that uniforms and shoes were also being provided to the students free-of-cost. In reply to a question, Mr Paracha said teachers were recruited from the community which had played an active role in motivating parents to send their children to schools. “They (teachers) are agents of social change,” he remarked. The first resettlement project was launched in December 2003 in the Hawkesbay Housing Scheme-42. 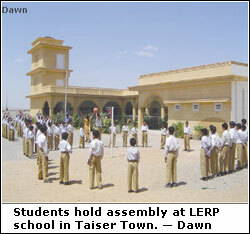 Taiser Town Scheme 45 is the second one while the third one is being developed in Baldia Town.